Twisted HUNT!!! A lil bit of fortune telling. Twisted Hunt has come around again. I always have fun trying to come up with something for it. This time the theme that was suggested was Divination. I knew that it would be a popular one and the one thing that I also knew was that for the most part people think of the popular types. Astrology, Tarot, crystal balls. That sort of thing. I do too so it isn’t anything off, and generally speaking… you know I’d love to make those things but because I wanted to do something a lil different I decided to think about what I might be able to do. 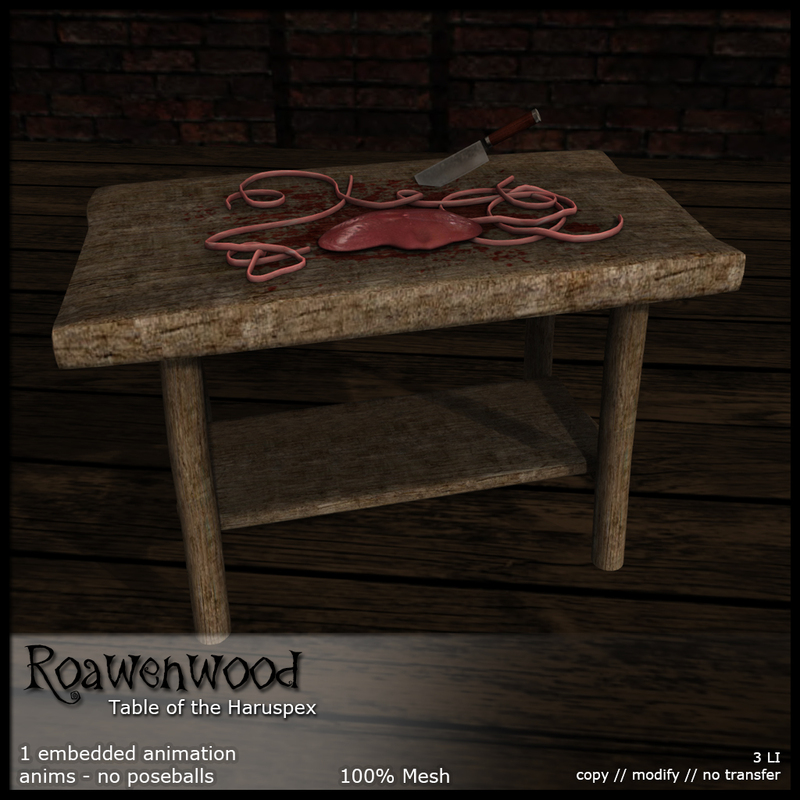 In an odd sort of way and with a weird streak I decided to make a table for the Haruspex. I’ll give you a second to look that up if you’re not familiar with it…..
Ok, I won’t make you look it up. General definition, a haruspex is someone who looks at an animals entrails to divine the future, that sort of thing. Eww right? Yea, a practice not generally seen today one would hope but at one point and among a great many people it was a fairly regular practice. So for this Twisted hunt we got a little bloody… but I hope you enjoy. And yea… I also know that’s a lot of entrails, I was thinking along the lines of a sheep since that was fairly common animal to use for this sort of thing. Out NOW at the main store in one of those twisty lil cubes. I DO have decoys out with the prize not set for sale but there IS one that is set for sale. Plus all my lil block piles. I haven’t exactly done a ton of decorating but a lil bit. Will have souvenirs and a few things out and about throughout the month. Have fun and don’t go too crazy doing the hunt. ← Monthly Picks Contest Winner!